Cleaning your beard is something that must be in your beard care routine. If you are cleaning your beard with a conventional bar of soap in the shower, then you are just making it worse than it already is. In just a couple of weeks, you will have dry, flaky skin underneath your beard and the beard will be riddled with knots, curls, in grown hair, runaway hair and split ends. That’s almost like a dense shrub that’s impossible to get into. So how do you clean it? Why, with a beard soap of course. Ah… I know what you are thinking. How to Pick the Right Beard Soap? Picking beard care products can be a bit confusing sometimes. With most beard care brands going all out to market and promote their own products as the holy grail of beard growth, it becomes difficult and tricky to pick one that works best for you. The topics for debate are increasing by the day. There’s beard oil vs. beard balm, beard oil vs. beard conditioner, beard comb vs beard brush and now beard shampoo vs. beard soap. When it comes to beard soap vs. beard shampoo, there is hardly any difference between the two with respect to the quality and the end result. The ingredients are identical, both products will soften your beard, clean it, exfoliate the skin and prevent dryness and beard itch. So, it boils down to your personal preference. Some people prefer using a soap bar because it is easier to rub a soap bar on your beard to generate some lather than picking up a bottle, squeezing out the shampoo and rubbing it between the palms to generate lather. Others prefer using their favorite beard shampoo brands along with conditioners. Cheaper: Soap bars are considered to be more economical than beard shampoos. Last Longer: At least for me, with shampoo comes the game of guesses: 'How much shampoo should I use?' Usually people end up using more than they should. Good for the Environment: Less pollution due to packaging. If this is your first time shopping for beard soaps, then all that talk about exfoliation, glycerin and natural oils can make your head spin. Nevertheless, it is important to know how to pick the best beard soap for yourself. So here’s a small guide that explains what to look for while selecting beard soaps. Talking about natural oils, hydration and preventing dandruff, people forget that the main purpose of a beard soap is to clean your beard. Look for a soap with exfoliating ingredients. Since beard soaps are mostly made of natural ingredients, you'll want to check the label for clay or ingredients like oats which work like a natural scrub. A good carrier oil blend is very important if you are looking to keep your beard hydrated even after the shower. A soap bar without carrier oils will typically leave your skin clean, but dry. Some beard soaps contain Shea butter in place of carrier oils, which is equally effective. Shea butter also helps to lock in the moisture and prevent dryness. You're not looking for a beard oil replacement, just for a soap that won't leave your beard dry. This is really simple. The ingredients need to be all natural. Anything synthetic is a big no on your beard or face. If you want to take it a step further, you can choose the product that its ingredients are the best for your beard and skin type. Essential carrier oils are pretty common ingredients in soaps (and many other beard products). Reading about essential & carrier oils and their main benefits, can help you with understanding how a specific soap can benefit you. The soap must lather easily. You don’t want to spend an hour rubbing the bar of soap between your fingers trying to form lather. This is a matter of personal preference over anything else. If you browse through the list of the best beard soaps, you will find soaps with a variety of natural fragrances to choose from. Last but not least; Size matters. you’d want the beard soap bar to last at least two weeks longer than the average bottle of beard shampoo. That’s one of the reasons why people choose soap. Because it lasts longer and provides better value. Having said that, there are a few popular brands that are selling dime sized soap bars for as high as $10. So, always check the dimensions of the soap bar before ordering. 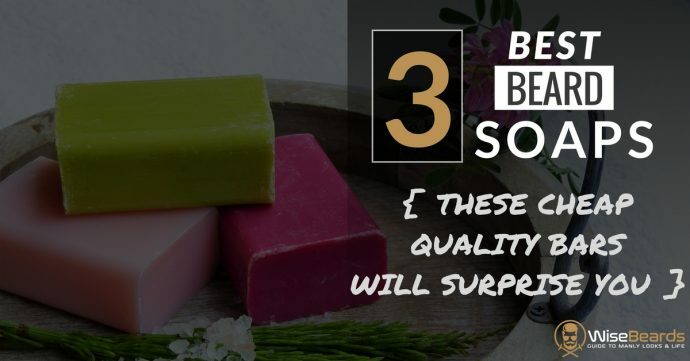 To make things a little easier I’ve done some of the hard work and have chosen 3 top contenders for the best beard soaps. I’ve reviewed them and summarized their pros and cons to help you make an informed decision. Professor Fuzzworthy’s Beard Shampoo is considered one of the top rated beard soaps on the market by several websites. This square shaped shampoo bar brings a blend of natural ingredients from down under. The bar is sized perfectly and fits right into your palm. It will retain the natural oils of the skin, prevent excessive sebum production, hydrate and nourish the skin and beard hair, soften it, reduce frizz and the Leatherwood Beeswax makes the beard manageable. The exfoliating ingredients give it a slightly rough texture which ensures that it doesn’t slip even if you rub it directly on your beard. You can rub it on your palms first to form a rich lather which you can apply on the beard. Olive oil, Coconut oil, Castor oil, Leatherwood beeswax, Tasmanian Seaweed, Cocoa powder, Leatherwood honey, essential oils such as: Tasmania's Kunzea and Lavender. All blended using the pristine spring water from Mount Wellington. Now that’s one of the purest and safest beard care recipes in the world. The fragrance from Tasmanian Kunzea oil is comparable to the refreshing aroma of eucalyptus. It also has a touch of honey. Lavender oil provides the perfect finishing touch to the recipe. The aroma is very subtle and is almost not noticeable unless someone decides to poke his nose into your beard. Great for skin problems such as dermatitis, eczema and of course, beard dandruff. If you want a soap with very light scent and great lather, this is the one for you. Honest Amish has an entire range of beard soaps but I feel that the extra grit version deserves to be on the top of this list. Let's see why. As the name suggests, this is hands down the most potent exfoliating beard soap that is equally gentle on your skin. Sounds ironical, doesn’t it? Honest Amish manages to pull it off here folks. This soap looks like a chunk of resin that’s sourced from rocky crevices in the Himalayas. But it’s actually a blend of natural carrier oils, essential oils with some powerful exfoliants (black walnut hulls, wild cherry bark and bentonite clay) thrown in for good measure. Cedarwood Oil, Clove Oil, Anise, and Lavender Oil, White Kaolin Clay, Black Walnut Hulls, Wild Cherry Bark (these are exfoliates) and Bentonite Clay. The aroma is a mild and spicy one with a hint of clove, eucalyptus, licorice and cinnamon dominating it. If you're looking for a cheap yet quality beard soap that will last you longer than the average beard shampoo. Coming from Honest Amish, you can be rest assured of the quality. Your beard will be clean and soft. You get 2 in one here. The extra grit soap is a great powerful exfoliant, that will leave your skin feeling clean and great. (You can use it on your body as well). Handmade in the USA with an intensely nourishing blend of carrier oils, essential oils and butter, this is the perfect cleansing bar for beards of all ages. This is not an exfoliating soap like the Honest Amish extra grit. Instead, this is more like beard shampoo that leaves the beard feeling soft and fresh. It lathers up easily and produces a thick lather that will leave your beard healthy, flake free and smelling amazing. Unlike regular soap bars this one will not strip your beard from its natural oils, thus making it dry. Coconut oil, Avocado Oil, Jojoba Oil, Olive Oil and Sustainable Palm oil form the hydrating and nourishing base which is rich in Vitamin E. The fragrance and dandruff removing properties are filled in by Lavender, Patchouli and Orange essential oils. To add to it, there’s a combination of Shea and Hemp seed butter, which gives the lather, a soft and creamy texture unlike anything that you’ve used. It has a very mild aroma of lavender and sweet orange, with patchouli. If you are looking for a gentle, long lasting and cleansing beard soap that will soften and detangle your beard, this is it. I hope you enjoyed browsing through my short list of the best beard soaps. This is not the most exhaustive list of beard soaps that you will ever come across. But I picked the ones I believe will serve you best. Hope you'll like them, please let me know in the comments.